If you haven't heard the news yet, there was a recent controversy about an all-male a capella group from Princeton University called the Tigertones, who were pressured into removing the song "Kiss the Girl" from Disney's The Little Mermaid from their set list. This comes right on the heels of another controversy regarding the holiday classic "Baby, It's Cold Outside" getting banned from various radio stations for similar reasons. Supposedly, both songs counteract the #MeToo movement because they are about women being coerced into situations that they have not consented to. The jury may be out on "Baby, It's Cold Outside," but as far as my favorite redheaded Disney heroine is concerned, this preconception is straight-up wrong. 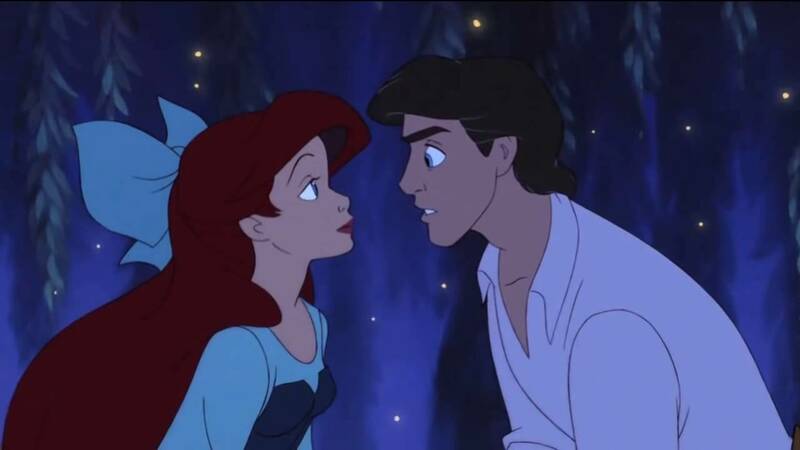 "Kiss the Girl" takes place after Ariel has given her voice up to Ursula in exchange for legs under the terms that Prince Eric must give her the kiss of true love to prevent her from turning into one of Ursula's sea worms and becoming her slave forever. The stakes are high for Ariel. Without the ability to explain herself to Eric, she is at a big disadvantage. That is where her friends come in. Sebastian, the most loyal and musically-inclined crab in all of Atlantica, reluctantly agrees to help Ariel try to win Eric over so she can get her voice back. He does so with a catchy musical number to set the mood for Eric to give Ariel the spell-breaking kiss. He would have succeeded, too, if Ursula's fledglings, Flotsam and Jetsam, didn't interfere. By performing this song, Sebastian acts as Ariel's voice when she has none. It is an incredibly selfless act of friendship. He supports Ariel's desires even though he neither understands nor agrees with them. Therefore, the song "Kiss the Girl" actually encourages helping and supporting women, not coercing them into uncomfortable situations. Ariel is my favorite Disney Princess. As such, I end up having to defend her a lot. Of all the Disney Princesses, she suffers the most hate from people who misunderstand her story. That's why this recent revelation is troublesome. It proves that people still don't get it. As beautiful as the original Hans Christian Andersen fairy tale is, it can be seen as problematic in ways that Disney tried to fix in their version. I've also written my own version of the story. Unlike the mermaid from the fairy tale who wanted to marry the prince for a chance at gaining a Christian soul, Disney's Ariel is an explorer who is obsessed with human culture. She collects as many human gadgets and gizmos as she can find from shipwrecks and clumsy sailors. She sings "Part of Your World," a beautiful song about her desire to live among humans, before even laying eyes on Prince Eric. Ariel encourages girls to study other cultures and to look beyond the lifestyles they're already familiar with. In the animated series, she meets lots of outcasts who don't feel like they belong anywhere until they met her. Her desire to become human is far more beautiful and layered than just wanting to find true love. If looked at from a completely objective standpoint, I can admit that the song might be misconstrued when taken out of context. With lyrics like "Yes, you want her / Look at her, you know you do" and repeating "Go on and kiss the girl" several times might be interpreted as someone encouraging a man to force himself on a woman without consent. However, Disney has the benefit of being incredibly mainstream. Their princess movies have stayed in the public eye for over 80 years. It would be very surprising indeed to find someone listening to this song who has never seen the movie and is not already aware of the context. The same cannot be said for something like "Baby, It's Cold Outside," which I only recently learned is from a 1949 musical called Neptune's Daughter. If "Kiss the Girl" had been a new song that came on the radio with absolutely no other context, perhaps I would be more open to some skepticism about it. However, the events of the story place it in a different light that neutralizes all of these arguments. In short, I am sick of hearing criticism about The Little Mermaid. The song "Kiss the Girl" is anything but misogynistic when listened to in the context of the film. Ariel is incredibly misunderstood by the general public. In some ways, that makes me love her all the more. She stands up for people who are different and feel as though nobody likes them and bravely goes head to head with her father, the all-mighty King Triton. The fact that she has a friend as wonderful as Sebastian who would get all the birds and fish in the lagoon to try to help her break the spell on her and save her life shows just how deserving she is of friendship and love.